Smoked ricotta, fragrant stewed sweet potatoes, and sweet and spicy hot honey combine to make this grilled cheese packed with flavor. We recommend using Salvatore Brooklyn's smoked ricotta because it is the best thing that's ever been invented, ever! Begin by making the stewed sweet potatoes. In a medium-sized soup pot, add 1 tbsp salted butter, chopped onions, sage leaf, red pepper flakes, salt, and pepper. Let cook until onions become translucent. Add sweet potatoes, red wine vinegar, and water. Cover and cook on low until sweet potatoes are tender and most of the moisture has been absorbed. If potatoes dry out, which they probably will before cooked through, add more water, 1/2 cup at a time. Meanwhile, whisk together honey and hot sauce until desired heat is reached. Assemble sandwich. 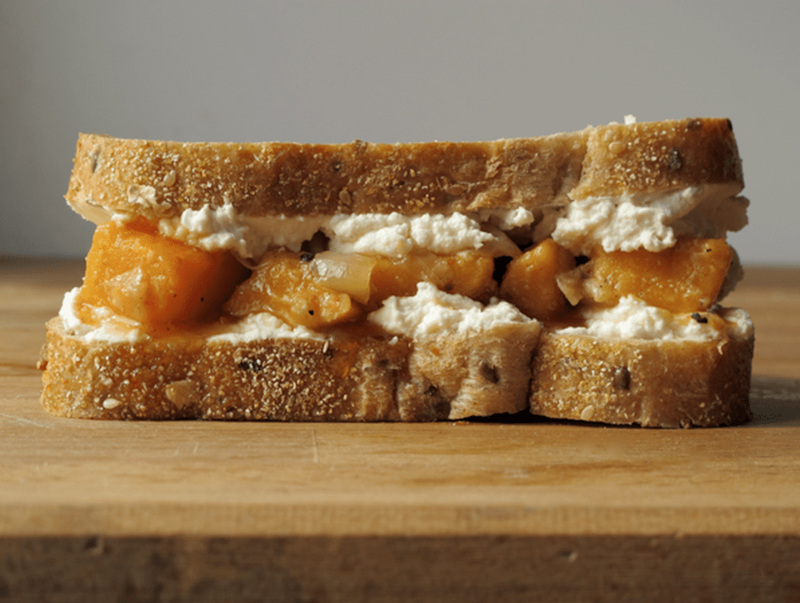 On one slice of bread, evenly distribute half of the smoked ricotta, then add the hot honey and the sweet potatoes. On the other piece of bread, add the remaining ricotta and butter the exterior of the sandwich. Press a sage, leave into each side and set aside. Grill the sandwich for a few minutes on each side until the cheese is heated through and the exterior crust is golden, brown and crispy.